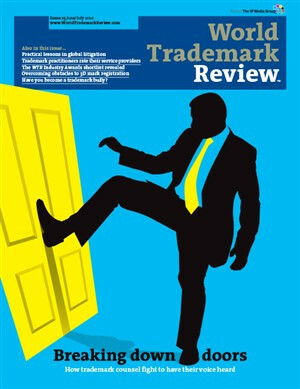 One of the most hotly debated topics in European trademark law over the past few years has been the question of whether the unauthorized use of a trademark as a keyword within a paid online referencing service (eg, Google’s AdWord programme) constitutes a use of that mark which the trademark owner may prevent under EU or national trademark law. The Court of Justice of the European Union (ECJ) decision on the questions referred by the French Court of Cassation in joined Cases C-236/08, C-237/08 and C- 238/08 found that Google’s use of trademark terms as keywords does not constitute infringement. A trademark owner has a legal duty to police its mark. But when does good-faith, albeit aggressive, protection of trademark rights become bad-faith bullying based on a claim of rights which do not exist? The WTR Industry Awards 2010, which will be presented at a ceremony in Boston timed to coincide with the 132nd INTA annual meeting, honour leading trademark teams and individuals across a range of business sectors. In this issue, we officially unveil the shortlist. The latest World Intellectual Property Organization (WIPO) statistics reveal that international trademark filings under the Madrid system fell by 16% in 2009, in a stark illustration of the impact of the global financial crisis. The Trademark Technical and Conforming Amendment Act 2010 provides for a study to examine “the extent to which small businesses may be harmed by litigation tactics by corporations attempting to enforce trademark rights beyond a reasonable interpretation of the scope of the rights granted to the trademark owner”. The act was sponsored by Senator Patrick Leahy (Vermont), in whose state Monster Energy Drinks sought to prevent a microbrewery’s use of the mark VERMONSTER for beer. The Court of Justice of the European Union (ECJ) has found that Google’s use of trademark terms as keywords does not constitute infringement, but noted that the advertiser’s use likely will – a decision which could cause the cost of online enforcement to rocket. The parties negotiating the Anti-counterfeiting Trade Agreement (ACTA) have published a full draft of the controversial treaty, which closely mirrors previously leaked texts and has sparked fears that the World Intellectual Property Organization (WIPO) is being undermined. The USPTO allows in-world use to qualify as ‘use in commerce’ for purposes of trademark registration, but how should brand owners protect their marks in virtual worlds and drive real-world profits? A number of issues are raised by the registration of ‘.it’ domain names, but these need to be overcome as ownership of domain names is crucial to obtain IP rights that can be defended against third parties. It is not normally feasible to register all possible domain name variations to protect your trademark, so brand owners need to carefully consider their selection methodology. The management of a well-structured domain name portfolio is at the heart of successful trademark protection and, crucially, will help to prevent costly actions later. With the ‘.рф’ domain extension approved, it is important that trademark owners plan registrations now, or risk costly enforcement action later. Use of a ‘.ca’ domain is often expected by Canadian consumers, but there are obstacles to registration and cybersquatting remains an issue. The time has come for brand owners to fight back against online infringement. There are a number of obstacles for foreign companies to overcome when registering a ‘.br’ domain name. While the Romanian domain name registry has assumed less responsibility than similar bodies in other jurisdictions, brand owners have a number of legal tools to protect their interests online. The IL-DRP plays a significant role in the resolution of domain name disputes through out-of-court proceedings. However, the source of its legal authority and the binding force of its decisions are uncertain. With more companies doing business in India, ‘.in’ domain names are coming under increasing demand. While litigation is usually regarded as a last resort in the event of infringement, sometimes it is difficult to avoid. In such cases it is important to ensure that you have the right strategy in place – particularly when the infringement has a cross-border dimension. Nowadays, when problems can arise in many corners of the world, the need to think ahead and understand how systems work in different countries is greater than ever.